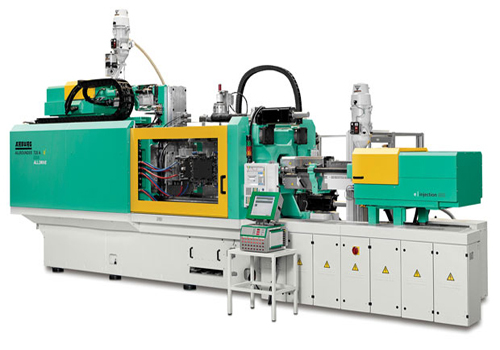 At Plast 2015, Arburg will present its Freeformer for the first time in Italy. Other exhibits in the injection molding area will include multi-component and liquid silicone rubber (LSR) processing, as well as applications for the packaging industry and the medical sector. A Freeformer will combine standard acrylonitrile butadiene styrene (ABS) material with a special support material to produce a key fob featuring a ball joint. The supporting structures are simply removed later in a water bath. At the show, Arburg will also demonstrate a high-end application built around a hybrid Allrounder 720 H in the “Packaging” (P) version as an example for the drinks industry. A 72-cavity mold from z-moulds is used to produce so-called PCO-1881 closures for carbonated soft drinks (CSD) in a cycle time of only around 3.5s. A Motan system is used for the material feed. The material throughput is over 160kg/h. Downstream, the production system comprises a closure cooling unit made by Nova Frigo and an optical quality control system from Intravis. An electric Allrounder 520 A with a clamping force of 1,500kN and a size 400 injection unit will demonstrate a thin-walled application. A two-cavity mold from DZ Stampi is used to produce lids with a part weight of 5.3g in a cycle time of around two seconds. The production of ballpoint pen caps from two components will be demonstrated by a hydraulic Allrounder 520 S with a clamping force of 1,600kN and size 400 and 100 injection units. An 8+8-cavity mold from Fila is used here. The main body is produced from polypropylene (PP) in a cycle time of around 20s, after which it is overmolded with soft styrene-butadiene thermoplastic elastomer (TPE-S). An electric Allrounder 520 E, with a clamping force of 1,500kN and size 800 injection unit will demonstrate the cost-efficient production of a technical medical part made from polyvinyl chloride (PVC). An electric Allrounder 470 E with a clamping force of 1,000kN and size 290 injection unit will be configured for processing liquid silicone (LSR) iPhone covers weighing 21g in a cycle time of around 20s. The mold is from Prover, while the LSR dosing system comes from 2 KM. Handling is performed by a Multilift Select robotic system with a load weight of 6kg. The Multilift Select is the entry-level model among the linear robot systems from Arburg. It features servo-electric drive axes and is fully integrated in the Selogica machine controller.